Fully Furnished - BARGAIN Price!! 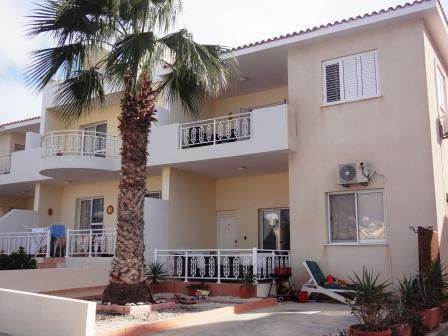 Kato Paphos, Paphos - This spacious two bedroom apartment is located in the popular holiday area of Tombs of the Kings. The beach is within easy walking distance, together with the local bus route and a wide variety of shops and restaurants. Being a project of two storey blocks only, the apartment is on the first and top floor. The property features a light and airy open plan living room with corner kitchen, and patio doors opening on to a large covered balcony with side sea views. The kitchen is well equipped with fridge, washing machine, built-in oven, electric hob and extractor fan. Also lots of cupboard space including a useful tall broom cupboard. Through an archway in the living area is a hallway leading to a large master bedroom, double size second bedroom and family bathroom. Both bedrooms have fitted wardrobes and the master bedroom also has patio doors accessing the balcony area. The project has it’s own car park with plenty of space for residents and visitors, and the communal swimming pool area is a great place to soak up the sun. The property has been well maintained by the current owners and has good quality finishes and many extras. It is being offered for sale fully furnished and has full title deeds. Please refer to MLS #: 1274 when inquiring.